Successfully Added LED Light Bulb - Super Warm White Spot (10W) to your Shopping Cart. Presenting the 10 watt eco-friendly LED bulb with a life span of 50,000 hours. Replace your old standard incandescent bulbs that eat away at your electrical bill every month with a new LED bulb and pocket the savings for months and years into the future! The G94 is a new arrival to our LED bulb family. Built with an all round aluminum casing with cooling fins to dissipate heat, this a professionally designed product meant to give you years of reliable use. Providing an effective lighting angle of 45 degrees, it comes in a super warm white color that blends into most residential and light commercial interior color schemes. Although this LED bulb seems like something from the future, it comes with a standard incandescent screw type socket to screw into any incandescent light fixture. This is a professionally designed light bulb (often called LED lamps in the trade). Our G94 model produces a super warm white (2700K) color light and emits enough light to replace incandescent and CFL's for many ambient lighting tasks. This LED bulbs whole purposes is to be environmentally friendly and provide the end user with savings in their utility bills - and the G94 does this in maximum style. The design and manufacture of these LED lights is beyond compare - from the all metal die cast cooling fins to the IC boards that drive the diodes, every part has been manufactured to exceed world performance standards. You simply cannot find a better built 10 watt screw in LED lamp than the G94! 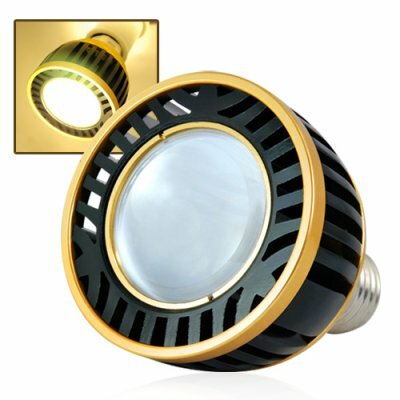 Great for retrofitting into existing track lights, downlights, or other lighting fixtures with a tighter spot type lighting, these warm tungsten LED light bulbs deliver smooth and uniform light distribution without any flicker, making the light output much more comfortable to look at than that of a CFL bulb. Chinavasion offers this LED light bulb with full QC testing before shipment. Then you can stock up on this new LED lamp to sell at your online / physical store or feature it in your latest eBay, Amazon or uBid listings. Long life (25x) as compared to incandescent bulbs. Low wattage; save energy, the environment, and also save money on your electric bill! True professionally designed lamp casing (heavy gauge all metal curvilinear design), not plastic like the cheap lights on the marketplace today. This is important - most LED's in the market today use plastic casings that will only last a few months before degrading, the G94 has an all metal design that will give you years of reliable use. Can I use this in my track light? Yes. It can be used in any lighting fixture with a standard incandescent screw base, including home or commercial track lights. Photos & Graphics By: L.H. Thank you for quick delivery, only three days! thanks for informing me about it. The light bulb is also very nice, really warm light.